An email from someone claiming to be a “spyware software developer” and extorting Bitcoin for silence is a scam, so learn how to act right in such a scenario. Extortion scams that circulate over email are trending these days. Also referred to as sextortion, this type of a hoax revolves around false allegations about a device hack, with subsequent threats to disclose some embarrassing nuances of the recipient’s lifestyle purportedly harvested in the course of a several months long compromise. While the basic idea of such messages is the same, their themes vary. 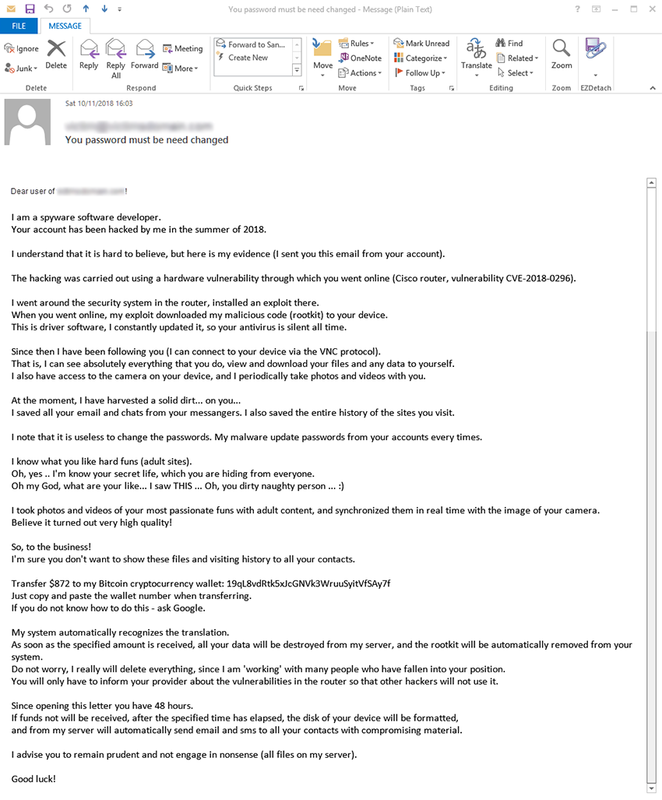 One of the latest campaigns in rotation since about mid-November 2018 originates from an impostor saying “I am a spyware software developer” as the email’s opening phrase. In a nutshell, the crook states he has harnessed a known router vulnerability codenamed CVE-2018-0296 to take root in the victim’s computer. This way, the ne’er-do-well was supposedly able to access all contacts as well as data stored on the machine and surveil the user behind the scenes. Some users may find the rogue message quite plausible due to one interesting peculiarity. It appears to have been sent from the recipient’s actual email account, which suggests that the hack is real. Furthermore, the indication of the victim’s email password right in the message body might get some people busy following the demands. The explanation for this trick can be twofold. The criminals are most likely to have obtained the account access information from a large-scale breach of an Internet service, with ensuing leaks of numerous users’ logins and passwords used for signing up. Meanwhile, chances are the villain uses a malicious technique called email spoofing. This way, the message will look as though it came from a specified email address, although that’s a misperception. – Password from account myemail@mydomain.ca: *password* (on moment of hack). If funds not will be received, after the specified time has elapsed, the disk of your device will be formatted, and from my server will automatically send email and sms to all your contacts with compromising material. Obviously, the malefactor tries to convince the victim that he has some nearly incriminating information about them. He claims to have noticed that the user was visiting adult sites a lot, engaging in things they wouldn’t like their family, co-workers and friends to know, to put it mildly. Moreover, the self-proclaimed “spyware software developer” purports to have made pictures of the user via the device’s camera when they were watching X-rated content. The culprit says he could connect to the computer by abusing the VNC (Virtual Network Computing) protocol. Then goes the extortion part proper. The con artist threatens to send the intimate materials to the user’s contacts. In order to avoid that, the victim is instructed to send about $850 worth of Bitcoin (the amount may vary) to the attacker’s BTC address. This disgusting scam deserves only one kind of treatment – removal. Indeed, the email can be removed without any pangs of conscience. In addition, it’s a good idea to check the computer for botnet activity or malware.